From left to right: S. Kako, Y. Arakawa, M. Holmes, K. Choi and M. Arita. Sources of single photons are vital for the future realization of several technologies including quantum key distribution, linear optical quantum computing, quantum teleportation, and also for quantum metrology. An ideal single photon source will provide one and only one photon on demand, and ideally would operate at room temperature (to avoid the necessity of large and cumbersome cooling systems). From a device engineering point of view, the technology to control the location of each single photon emitter would also be of great importance, as it would enable the fabrication of arrays of emitters. To date, examples of solid state single photon sources in the literature that are able to operate at 300K rely on emitters which have not had their physical location determined, (in short: they form at random locations). Examples include defects in diamond  and SiC , molecules  and quantum dots [4,5]. Whilst effort is being made to control the location of single photon emitters, particularly with quantum dots, all examples of site controlled emitters in the literature must be cryogenically cooled before they can be operated. In our recent publication , we describe a device that is both site controlled, and also operates at 300K. Furthermore, it is created from III-Nitride semiconductors, so that it can in principle be integrated with other semiconductor systems for future device applications. Our device is based on a GaN quantum dot embedded in a site controlled nanowire. These devices are grown by selective area metal organic chemical vapour deposition, meaning that the emitters can be fabricated into arrays of almost any pitch. For our optical experiments we utilized a low density of nanowires so that we could easily excite, and isolate the emission from, a single device. Figure 1: A schematic of a single nanowire quantum dot emitting a single photon, and also the autocorrelation function of the collected emission. The low intensity peak (at time delay 0) is proof of the single photon emission from the site controlled quantum dot. Because of the strong quantum confinement in this type of quantum dot, it should theoretically be possible to keep excitons inside them for long enough that they can recombine and emit single photons even at room temperature. 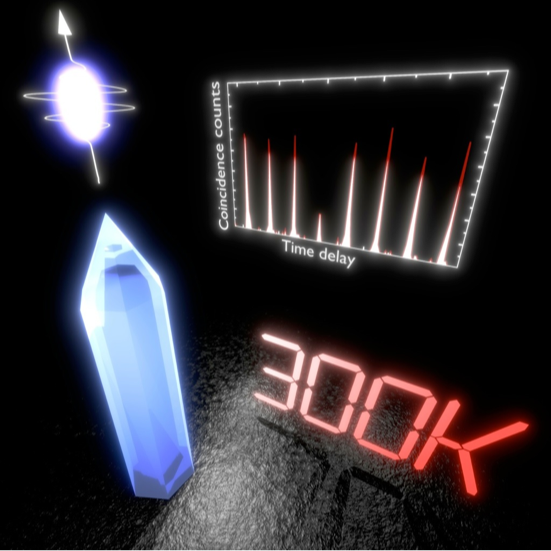 We found that this is indeed the case by directing the light emitted from a quantum dot into a detection system consisting of a 50/50 beam splitting mirror and two photon detectors, finding a large suppression in the number of simultaneous detection events in the two detectors (a single photon could only ever be detected in a single detector). An intriguing property of this device is that the quality of the single photons (the degree to which we can say we have a single photon source) seems to be independent of the operation temperature. Many previous studies on single photon sources showed a degradation of the single photon statistics with elevated temperatures, which we have avoided in this case by using low density, site controlled, small GaN quantum dots providing a high spectral purity, even at high temperatures. We believe that this is a big step forward towards the eventual realization of future quantum technologies that may work at room temperature. N. Mizuochi, T. Makino, H. Kato, D. Takeuchi, M. Ogura, H. Okushi, M. Nothaft, P. Neumann, A. Gali, F. Jelezko, J. Wrachtrup, S. Yamasaki, "Electrically driven single-photon source at room temperature in diamond", Nature Photonics, 6, 299 (2012). Abstract. S. Castelletto, B. C. Johnson, V. Ivády, N. Stavrias, T. Umeda, A. Gali, T. Ohshima, "A silicon carbide room-temperature single-photon source", Nature Materials, 13, 151 (2014). Abstract. B. Lounis and W. E. Moerner, "Single photons on demand from a single molecule at room temperature", Nature, 407, 491 (2000). Abstract. P. Michler, A. Imamog brevelu, M. D. Mason, P. J. Carson, G. F. Strouse, S. K. Buratto, "Quantum correlation among photons from a single quantum dot at room temperature", Nature, 406, 968 (2000). Abstract. S. Bounouar, M. Elouneg-Jamroz, M. den Hertog, C. Morchutt, E. Bellet-Amalric, R. André, C. Bougerol, Y. Genuist, J.-Ph. Poizat, S. Tatarenko, K. Kheng, "Ultrafast Room Temperature Single-Photon Source from Nanowire-Quantum Dots", Nano Letters, 12, 2977 (2012). Abstract. Mark J. Holmes, Kihyun Choi, Satoshi Kako, Munetaka Arita, Yasuhiko Arakawa, "Room-Temperature Triggered Single Photon Emission from a III-Nitride Site-Controlled Nanowire Quantum Dot", Nano Letters, 14, 982 (2014). Abstract.